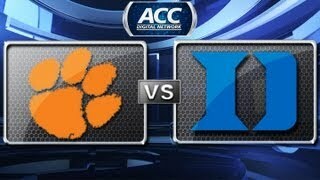 Duke University wins their second ACC game of the season by clocking Clemson in a 68-40 blowout. The Devils improve their season to 15-0 overall and 2-0 in ACC play. Duke was propelled by sophomore PG Quinn Cook, who lead all scores with a career high of 27. Ryan Kelly added 12 points, while Seth Curry and Mason Plumlee each scored 8. Plumlee also added 13 rebounds and 5 assists to his stat sheet for the night. As impressive as Quinn Cook was on offensive, it is Dukes defense that should be applauded in this game. The Blue Devils held Clemson to 28.3% from the field in last nights matchup. The Tigers were able to put only 10 points on the board before heading into the locker room at halftime, I was not in the room but I can't imagine that Clemson coach Brad Brownell was particularly pleased with his teams first half performance. In Clemson's defense, they were playing the best team in the country on, arguably, the hardest arena in college sports to play in as the visiting team. The biggest concern for Duke Coach Krzyzewski and the Blue Devils is that senior Forward Ryan Kelly left the game just before halftime with an ankle injury. Kelly remained in a warmup suit on the bench for the remainder of the game. While the x-ray was inconclusive the team waits for the results of a CAT to show how bad the injury is. Kelly has struggled with ankle injuries since late last season, when an tweak of the same ankle forced him to miss all of the ACC tournament. Without Kelly, Duke would lose some depth in the post, but the emergence of freshman Forward Marshal Plumlee will give the Devils some more breathing room in the post. Duke is playing like the number one team in the nation. With the nations 3rd toughest strength of schedule and top RPI rating, the Devils are preparing themselves to dominate a fairly weak ACC this year. If Coach K can keep this team healthy, there is no team that Duke could not beat.